7 TH GRADERS WELCOME! 1. Row Leaders: Please pick- up folders. 2. Have a seat before the bell rings or you will be late. :O) 3. Get out your materials. 1 7 TH GRADERS WELCOME! 1. Row Leaders: Please pick- up folders. 2. Have a seat before the bell rings or you will be late. :O) 3. Get out your materials and prepare to write your agenda. -Thank you! 2 A QUICK REMINDER: Make sure all water breaks, bathroom breaks, pencil sharpening, backpack cleaning, etc… are done BEFORE the bell rings. Do not get out of your seat without permission. If you are eating, put it away or throw it away. Do NOT shoot trash into the trash can. Be ready to work and stay on task. 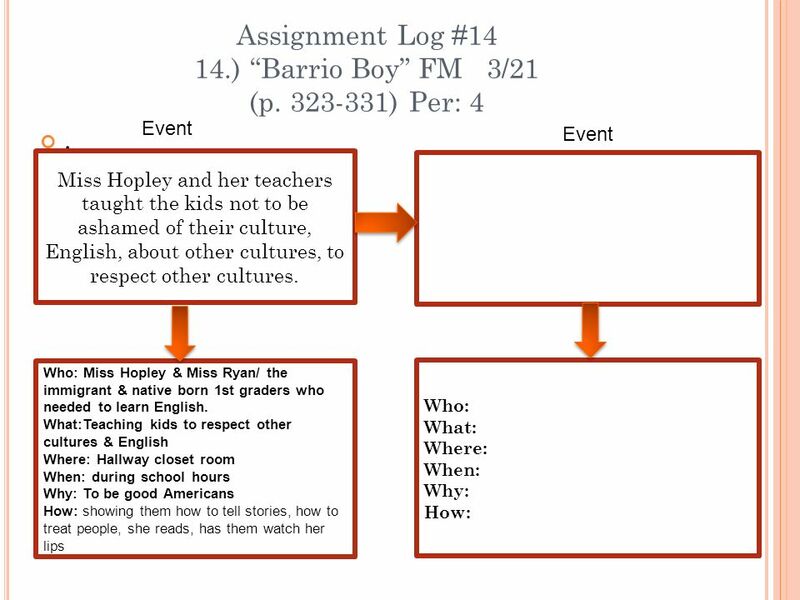 4 ASSIGNMENT LOG #18 18.) 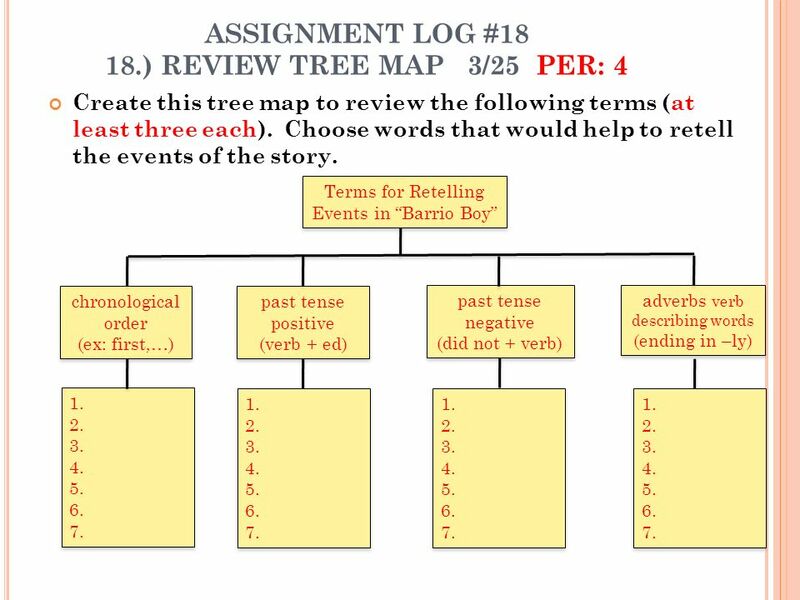 REVIEW TREE MAP 3/25 PER: 3 Create this tree map to review the following terms (at least three each). Choose words that would help to retell the events of the story. chronological order (ex: first,…) chronological order (ex: first,…) past tense positive (verb + ed) past tense positive (verb + ed) past tense negative (did not + verb) past tense negative (did not + verb) adverbs verb describing words (ending in –ly) adverbs verb describing words (ending in –ly) Terms for Retelling Events in Barrio Boy 1. 2. 3. 4. 5. 6. 7. 1. 2. 3. 4. 5. 6. 7. 1. 2. 3. 4. 5. 6. 7. 1. 2. 3. 4. 5. 6. 7. 1. 2. 3. 4. 5. 6. 7. 1. 2. 3. 4. 5. 6. 7. 1. 2. 3. 4. 5. 6. 7. 1. 2. 3. 4. 5. 6. 7. 5 ASSIGNMENT LOG #18 18.) 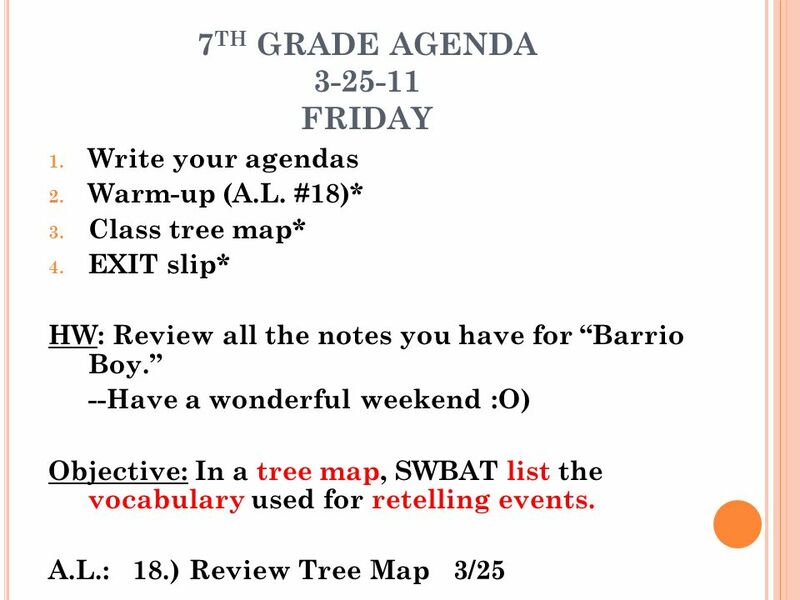 REVIEW TREE MAP 3/25 PER: 4 Create this tree map to review the following terms (at least three each). Choose words that would help to retell the events of the story. chronological order (ex: first,…) chronological order (ex: first,…) past tense positive (verb + ed) past tense positive (verb + ed) past tense negative (did not + verb) past tense negative (did not + verb) adverbs verb describing words (ending in –ly) adverbs verb describing words (ending in –ly) Terms for Retelling Events in Barrio Boy 1. 2. 3. 4. 5. 6. 7. 1. 2. 3. 4. 5. 6. 7. 1. 2. 3. 4. 5. 6. 7. 1. 2. 3. 4. 5. 6. 7. 1. 2. 3. 4. 5. 6. 7. 1. 2. 3. 4. 5. 6. 7. 1. 2. 3. 4. 5. 6. 7. 1. 2. 3. 4. 5. 6. 7. 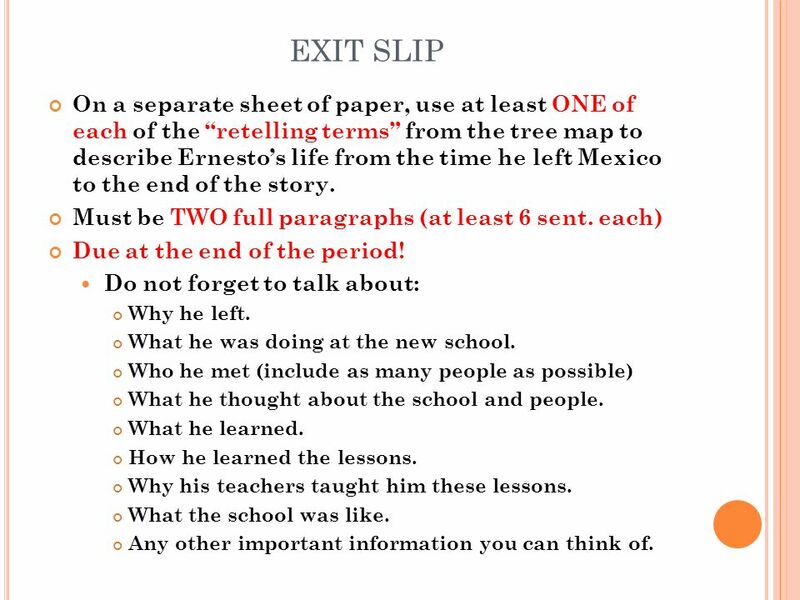 6 EXIT SLIP On a separate sheet of paper, use at least ONE of each of the retelling terms from the tree map to describe Ernestos life from the time he left Mexico to the end of the story. Must be TWO full paragraphs (at least 6 sent. each) Due at the end of the period! Do not forget to talk about: Why he left. What he was doing at the new school. Who he met (include as many people as possible) What he thought about the school and people. What he learned. How he learned the lessons. Why his teachers taught him these lessons. What the school was like. Any other important information you can think of. 7 Assignment Log #14 14.) Barrio Boy FM 3/21 (p. 323-331) Per: 3. Ernesto and his mother meet Mrs. Hopley and they couldnt understand what she said, but they could tell she was friendly. Event Who: w/ his mom, going to see principal What: registering Where: Lincoln Elem./ America/ Sacramento, Ca. When: 1910 Why: they left Mexico for safety. How: Who: They met Mrs. Hopley What: They couldnt understand her. Where: In Mrs. Hopleys office When: his first day of school. Why:He needed to register for school How: They felt welcomed. Ernesto went to Lincoln School for his first day of school in America. 8 Assignment Log #14 14.) Barrio Boy FM 3/21 (p. 323-331) Per: 3. Ernesto was assigned to Miss Ryans classroom. Ernesto and other first graders received private English lessons. 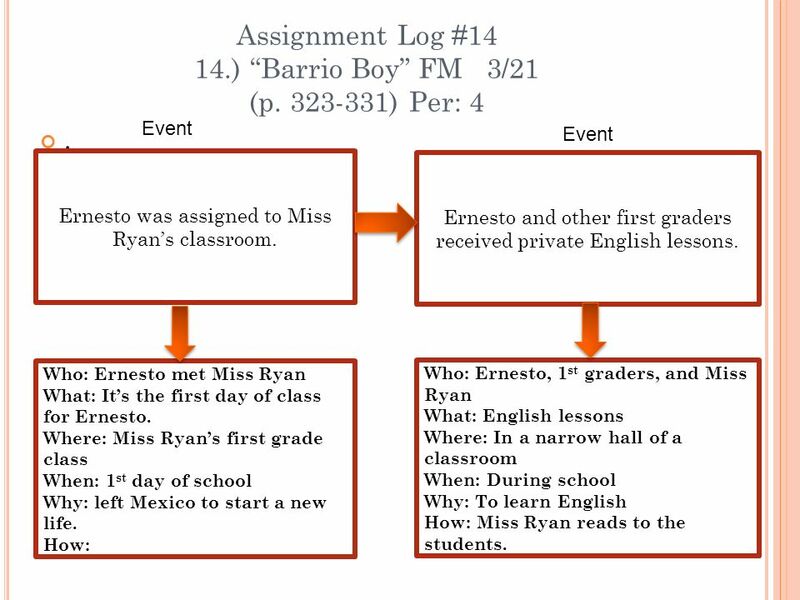 Event Who: Ernesto met Miss Ryan What: Its the first day of class for Ernesto. Where: Miss Ryans first grade class When: 1 st day of school Why: left Mexico to start a new life. How: Who: Ernesto, 1 st graders, and Miss Ryan What: English lessons Where: In a narrow hall of a classroom When: During school Why: To learn English How: Miss Ryan reads to the students. 10 Assignment Log #14 14.) Barrio Boy FM 3/21 (p. 323-331) Per: 4. Ernesto enrolled in Lincoln Elem. in Sacramento, Ca. He went with his mom to see the principal (Mrs. Hopley) Ernesto and his mom went to Mrs Hopleys office and met her. They felt a warm welcome, but they didnt understand her because they didnt speak English. Her eyes showed she was very welcoming. 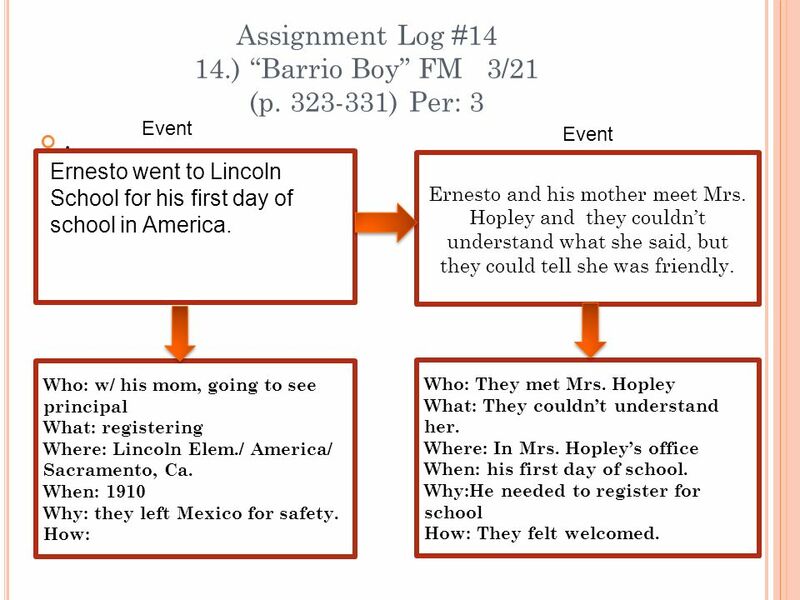 Event Who: Ernesto w/ mom, met Mrs. Hopley What: Enrolling Ernesto in school Where: Lincoln Elem., in Sacramento, Ca. When: 1910 when he was a kid. Why: They had to move from Mexico because of war. How: They walked to the school. 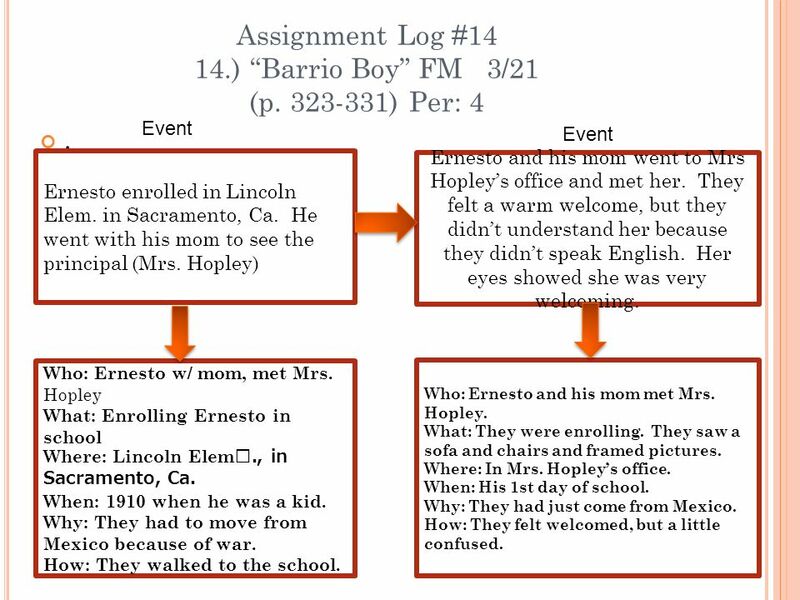 Who: Ernesto and his mom met Mrs. Hopley. What: They were enrolling. They saw a sofa and chairs and framed pictures. Where: In Mrs. Hopleys office. When: His 1st day of school. Why: They had just come from Mexico. How: They felt welcomed, but a little confused. 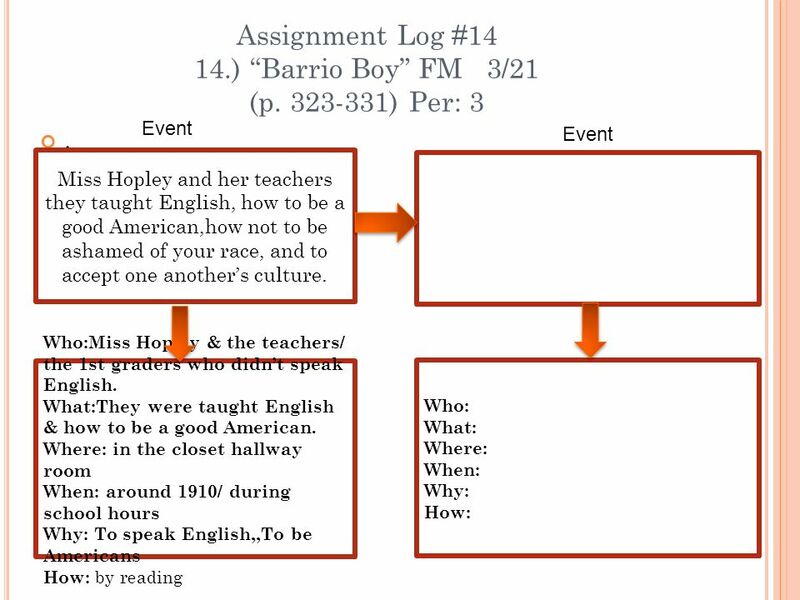 11 Assignment Log #14 14.) Barrio Boy FM 3/21 (p. 323-331) Per: 4. Ernesto was assigned to Miss Ryans classroom. Ernesto and other first graders received private English lessons. Event Who: Ernesto met Miss Ryan What: Its the first day of class for Ernesto. Where: Miss Ryans first grade class When: 1 st day of school Why: left Mexico to start a new life. How: Who: Ernesto, 1 st graders, and Miss Ryan What: English lessons Where: In a narrow hall of a classroom When: During school Why: To learn English How: Miss Ryan reads to the students. 13 W INDING D OWN *Class is almost over, so it is time to: 1. STAY IN YOUR SEATS!!! 2. Stamp A.L.s & folders 3. Recap: Did you accomplish this objective? 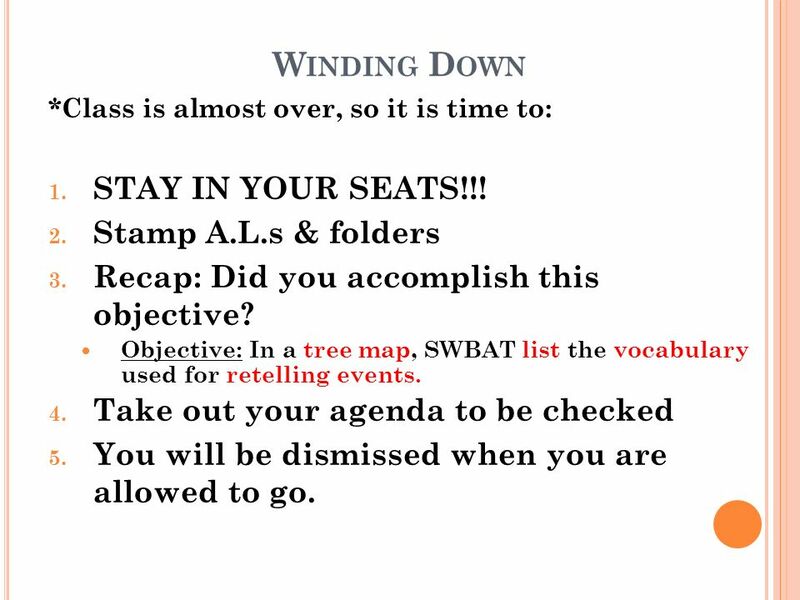 Objective: In a tree map, SWBAT list the vocabulary used for retelling events. 4. Take out your agenda to be checked 5. You will be dismissed when you are allowed to go. 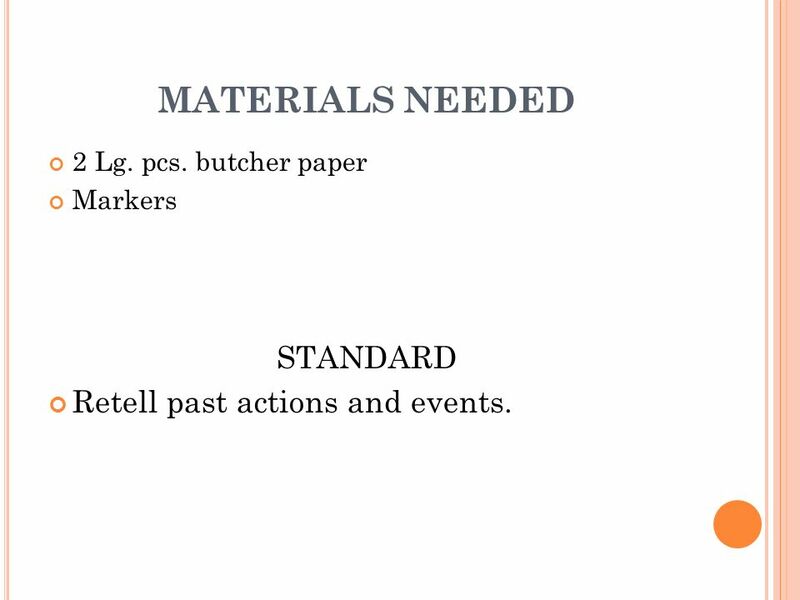 14 MATERIALS NEEDED 2 Lg. pcs. butcher paper Markers STANDARD Retell past actions and events. 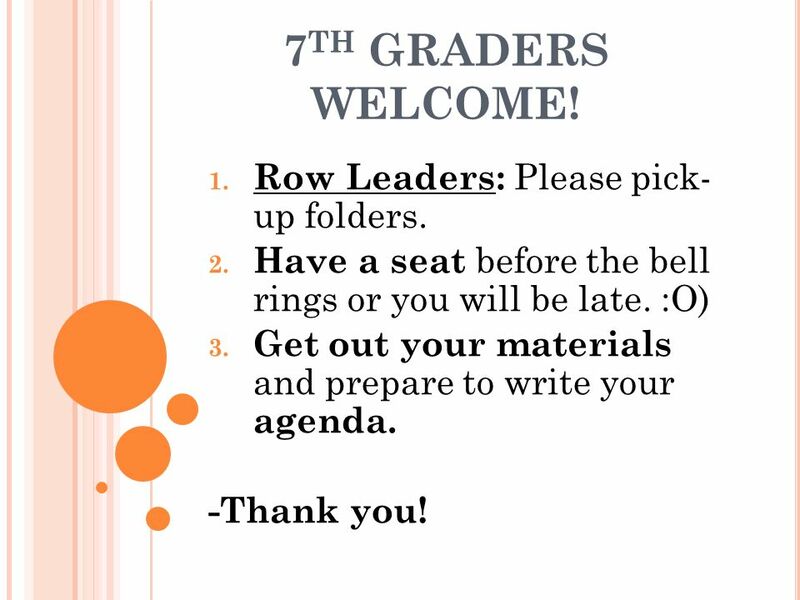 Download ppt "7 TH GRADERS WELCOME! 1. Row Leaders: Please pick- up folders. 2. Have a seat before the bell rings or you will be late. :O) 3. Get out your materials." 7 TH G RADERS W ELCOME ! 1. Row Leaders: Please pick- up folders. 2. Have a seat before the bell rings or you will be late. :O) 3. Get out your materials. Policies & Procedures Mrs. Gales’ Class. Welcome to Ms. Hlushak’s Class!!! Welcome to 4 th Grade Miss Pender Room 209. Why we have rules and procedures … Keep us safe Save time Making sure learning is happen Feel comfortable. Te acher Name and Content In our class We agree NOT to hit anyone. 2. We agree to be prepared for class. 3. We agree to respect each other and. Classroom Procedures Miss Crotty’s Class. Class Procedures What are they?. Entering class  Enter class quietly  Go directly to your assigned seat. Be in your seat when the bell rings.  Get. Are you ready to learn about the exciting history of our GREAT COUNTRY? Welcome To Mrs. Carlton's Room. Entering the Class Come in quietly. This not a social time. Get out your morning work,agenda,and homework Make sure. Mrs. Martinez Math 8 & AVID About Me… Love math and science! UCLA – Engineering Mechanical Engineer for 6 years Mom - 3 children + dog + husband. 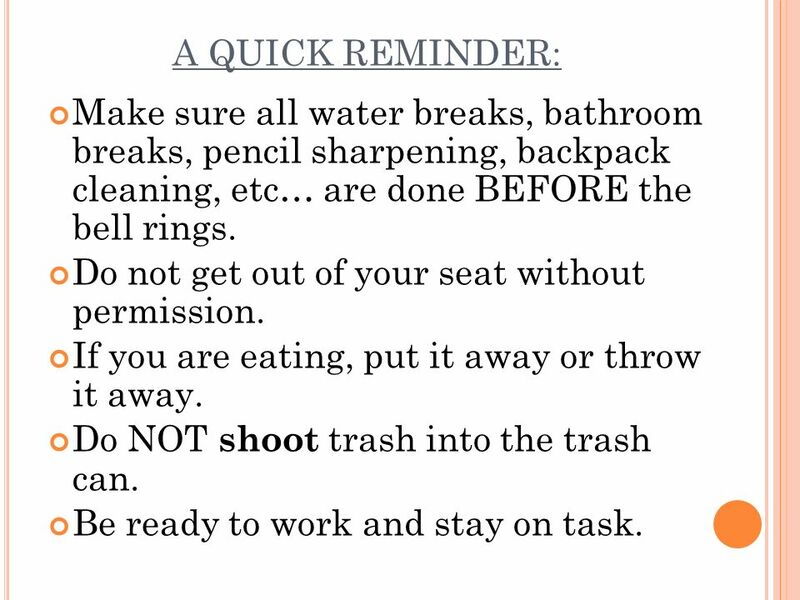 Mason Creek 7 th Grade Procedures. Agenda  Students are required to get it signed each night.  The 5th period teacher will check each Friday for signatures.